The entrance to the cave is situated in the Baška rock in the northern part of Low Tatras. It is only two kilometers far from the Demänovská cave of freedom. 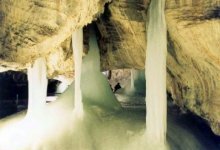 The ice ornamentation in the cave has formed during last 500 years. Together with the sinter ornaments it creates an attractive sightseeing tour. The Demänovská valley is the most famous and beautiful valley in the Low Tatras. With a length of 15 km it is the main tourist centre on the north side of the main ridge. From a geographical and geological point of view it consists of two distinct parts: the upper part, adjacent to the main ridge, is composed of granite and creates a whole complex of smaller valleys while the lower part is composed of limestone and has a complicated vertical profile. The valley had already been populated in prehistoric epoch. It has been proven by archeological discoveries in the Okno cave. Later on, it wasn’t populated until 18-th century. During 18-th and 19-th century, there were chalets, lumberjack’s and shepherd’s huts and there were also several ore mines. The interest in the valley went up after the discovery of the Demänovská cave of freedom in 1921. A solid road was build soon after. The popularity of the valley increased even more after a a chairlift from Jasná to Chopok had been built (it only runs to Luková nowadays). The Demänovská valley is an important speleological region in Slovakia.